10 free cards from Tiny Prints! 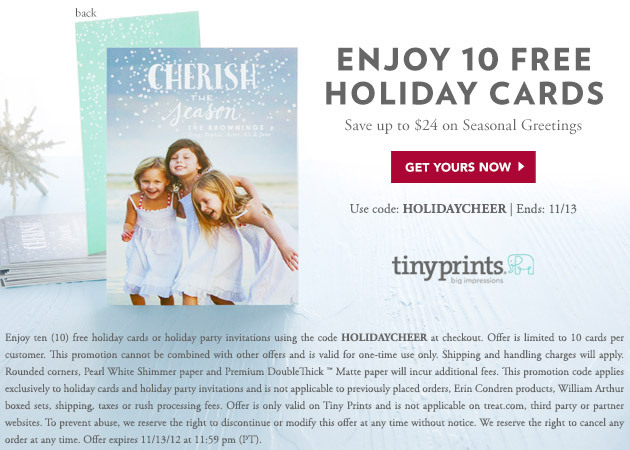 Starting today, Tiny Prints is offering 10 free holiday cards to all customers – new and previous customers. This is a $24 value and the offer begins….NOW! It ends at 11:59p.m. 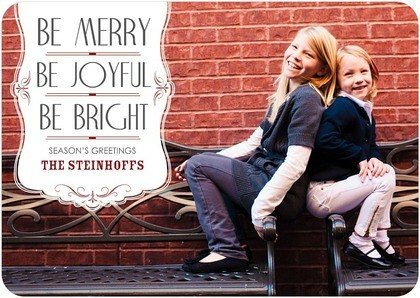 (PT) on Tuesday, November 13, so you have a few days to get your photos together and order your cards. Want to see three cards I’m considering? So, the details. Visit Tiny Prints. Select your cards. Add your photos, edit your text. 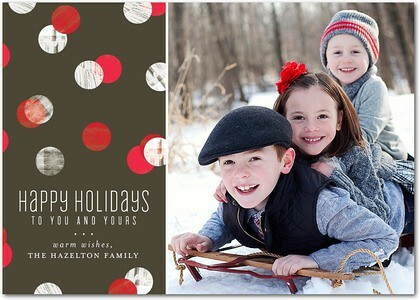 Upon checkout, use the promo code HOLIDAYCHEER for the 10 cards. And if you want to send a card to me, just let me know. I’m all about Christmas cards at my house! Legal stuff: Offer is limited to 10 cards per customer. This promotion cannot be combined with other offers and is valid for one-time use only. Shipping and handling charges will apply. Rounded corners, Pearl White Shimmer paper and Premium DoubleThick ™ Matte paper will incur additional fees. This promotion code applies exclusively to holiday cards and holiday party invitations and is not applicable to previously placed orders, Erin Condren products, William Arthur boxed sets, shipping, taxes or rush processing fees. Offer is only valid on Tiny Prints and is not applicable on treat.com, third party or partner websites. To prevent abuse, we reserve the right to discontinue or modify this offer at any time without notice. We reserve the right to cancel any order at any time. Offer expires 11/13/12 at 11:59 pm (PT). More disclaimer stuff: I was not compensated for this post. There are affiliate links above, but all opinions are my own.